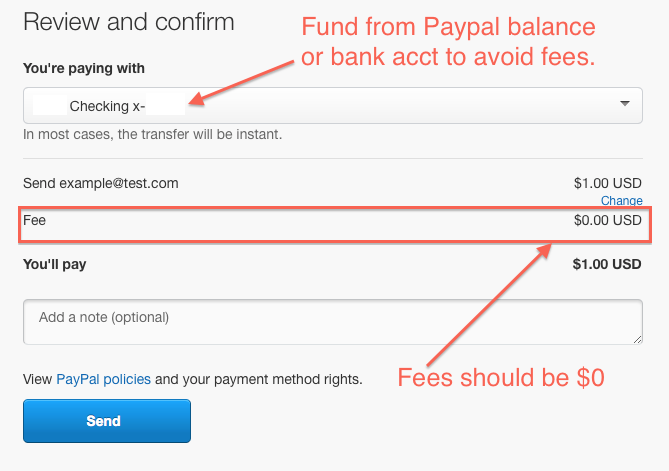 If you need to send a friend some money, and you have a Paypal account, but don't want to let Paypal keep any of your money as fees, just follow these simple steps to send money fee-free. Keep this page handy as reference for the future. 2. Click on the "Send & Request" tab. 3. Click the "Send money to friends or family" link. 4. Input your friend's email address in the field and input amount. 5. Verify on the next page that the fee reads $0.00. Make sure you fund it from your bank account or PayPal balance for it to be fee-free. If you use your credit card, PayPal will still keep the 2.9% + $0.30 per transaction.